I’m still terribly behind on my reading…lots of side projects and “required” reading have sidetracked me, and I’m still not all caught up from everything I wanted to read in the first 6 months of the year. This month I’m spotlighting 3 debuts I’m excited to check out. I’ve read Sarah McCarry’s blog when it was The Rejectionist, and to say I’m excited for this book is an understatement. Music, mythology, and Sarah’s voice…I’m thrilled. Welcome to the world of informercial diet plans, wedding dance lessons, embarrassing run-ins with the cutest guy Ann’s ever seen—-and some surprises about her NOT-so-perfect mother. And there’s one more thing. It’s all about feeling comfortable in your own skin-—no matter how you add it up! There have already been several body image/weight books, all with a different spin on the subject, but I’m interested enough in this contemporary to see if it’s worth recommending to teens. This synopsis just screams STAKES and stories set in space are popular. I can see pitching this to fans of Across the Universe, Ender’s Game, and Insignia. What new July releases are you looking forward to reading? I’m behind on my 2013 reading as well. 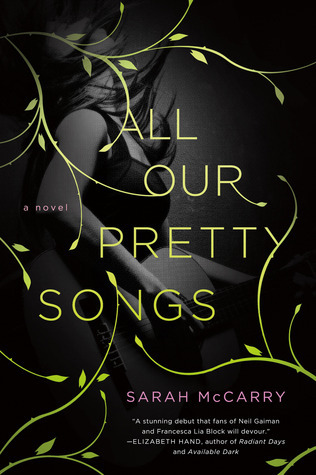 All Our Pretty Songs by Sarah McCarry is on my need-to-read pile since I have an ARC for it. It sounds really interesting. I’m not much of a science fiction reader, but I’m really looking forward to Star Glass because I so enjoy Phoebe’s smart blog posts. I’ve gotten a bit overwhelmed with all the releases lately, but I’ve already read and really loved Jennifer Echols’ YA that’s coming out in July, Dirty Little Secret. All look really good, can’t wait to read your reviews!